The blogger favourite Victoria Beckham top sold out at Net-A-Porter and Selfridges at its original retail price of about £330. However, I found this near identical piece from New Look for £12 in the sale (originally cost £22.99). 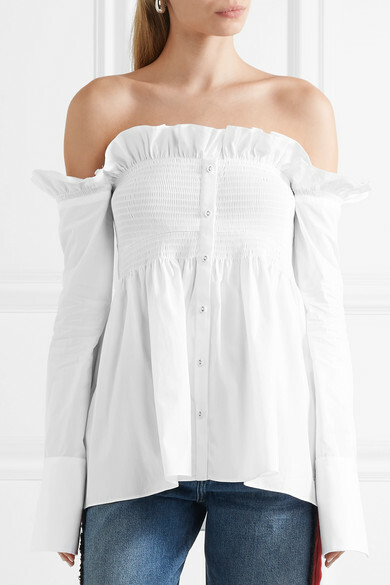 This is an off-shoulder shirt, cut from lightweight white cotton poplin. It features structured cuffs, mini buttons, smocking and a frill at the chest for a feminine silhouette and is perfect for summer. I am a size UK 8 and found that the size S/M fit me without stretching much so I think this size will fit up to size UK 12 and I reckon the size M/L would fit size UK 14 to UK 18 as both the bust area and top of the sleeves are elasticated. 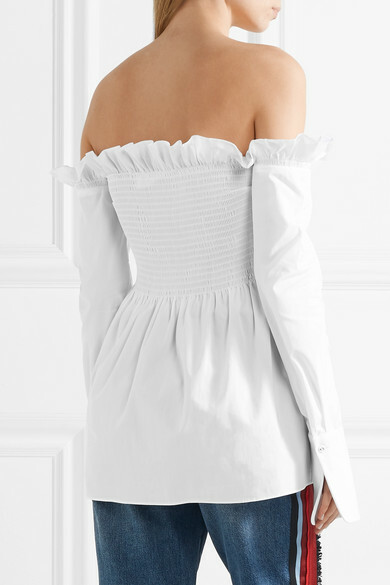 This Phyllis off the shoulder shirred cotton poplin top by Walter Baker, a N.Y.C.-based label famed for its super versatile basics with a high-fashion focus has better quality than the New Look piece so understandably it has a higher price. The original price was £115 and is now £58 in the sale. You can purchase it here. It also comes in other colours including the stripe version which Victoria Beckham also has.